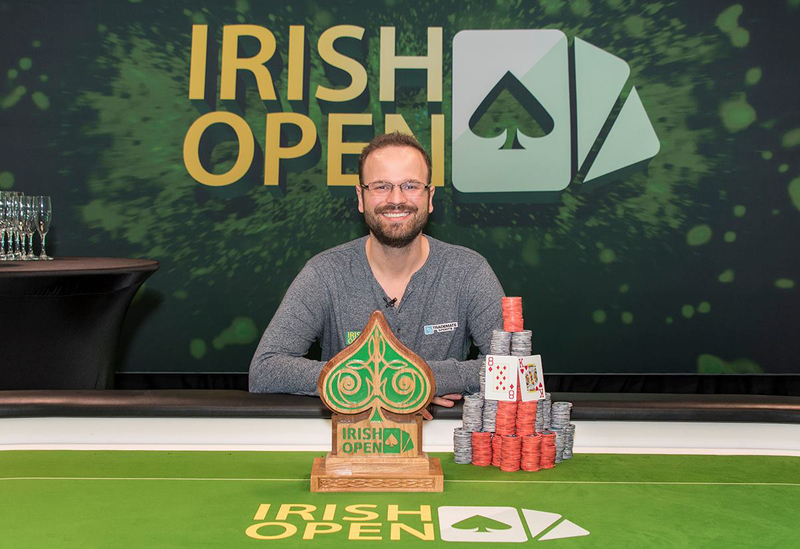 November Niner Griffin Benger has won the 2017 Irish Poker Open Main Event and €200,000, outlasting a record-breaking field of 1,129 – the largest ever seen at the Irish Open. A total prizepool of €1,128,295 was paid out amongst the top 135 finishers, with the largest shares awarded to the final table of nine. Reaching heads up, Mihail Mazilu had a two-to-one chip lead but it didn’t last long. After a flopped straight was paid maximally for Benger, he had his opponent all-in and drawing thin within ten minutes. Benger’s hand held and Mazilu picked up €125,000 for second place while Benger’s delighted rail swarmed the stage to have their picture taken with the Canadian pro. The three-day €1,150 Main Event was part of the (still ongoing) poker festival combining the Irish Poker Open and the Norwegian Masters held at the Citywest Hotel in Dublin. As the Main Event concluded, over 320 Norwegian players filled the convention centre with 6-Max Omaha tables, and will continue to do so this week as the Masters continues to break its own side event records. Among the many side events taking place this week was the €350 Liam Flood Memorial 6-Max Turbo, which attracted 210 entrants and was won by Thomas Haarstad for €15,595. Bjorn Geissert beat ex-Liverpool footballer John Arne Riise heads up to win the prestigious JP Poker Masters, outlasting 255 other players in total to take home €26,960, and Kevin Killeen is the 2017 Irish Open High Roller Champion (his prize for outlasting 67 other players a cool €38,585). A €500,000 guarantee and legendary atmosphere – including Beer Pong, Shuffleboard and Sumo Suit wrestling contest – make the Irish Open one of the world’s most prestigious, lively and unmissable poker festivals in the world. We look forward to next year!